Pineapple is a delicious tropical fruit that's perfect for more than just eating–let it inspire you to get crafty! These summery DIY projects are great for warmer weather and lazy days in the sun. Make them for fun, with friends or to give as gifts! This DIY pineapple tee is the perfect casual shirt to wear this summer for backyard BBQs, road trips, or to the beach. Best of all, it's quick to make using a Silhouette machine and highly durable to being washed. Pineapple patterned everything is very popular right now, so one original way to incorporate the trend in your home is to make a small wooden pineapple-shaped cutting board. Use it to cut fruit or as a serving tray for a cheese board. These glam gold pineapple bookends add some fun visual interest to any bookcase. Skip the typical paper party hats and make your own pineapple hats instead! These are perfect for a summer birthday party. Slip on your favorite maxi dress and accessorize with these fun DIY pineapple earrings. They're made out of shrink plastic, which might bring you back to your childhood crafting days! Paint mini pineapples onto a clear inflatable beach ball for a customized summer accessory you can bring to every pool party and beach day this summer. Your child will never mix up their bookbag with another child's again when you make them this fun pineapple drawstring bag. Send them off to summer camp or school with this adorable backpack that is fully lined and made with yellow quatrefoil and green fabric. Transform an ordinary pencil case into a pineapple pencil case and bring a little summer fun to your back-to-school crafts. Hang up all your summer vacation photos with mini gold pineapple push pins. These mini pineapple treat boxes are adorable and perfect to hand out at your next summer or tropical themed party. Are you musically inclined? Break out the paint and your ukulele to make your own super fun pineapple instrument! It will surely be a hit at parties and campfires when you dazzle your friends and family with the combination of your custom ukulele and your musical talents. All it takes is a paper lantern and some crepe paper to create a pineapple piñata. Any backyard BBQ you host this summer will be way more fun with a few of these as decorations. Plus, piñatas are always a big hit ​with the kids. Going away on summer vacation? Pack up all your makeup in a handmade pineapple pouch. Either sew your own makeup pouch from scratch or start with a blank pencil case and use a mini pineapple stamp to add the design to the pouch. This no-sew bathmat is so fun for your guest bathroom this summer. Your kids' bathroom is also a great place for it! Or even leave it by your backdoor so people can quickly dry their feet after coming in from the pool. 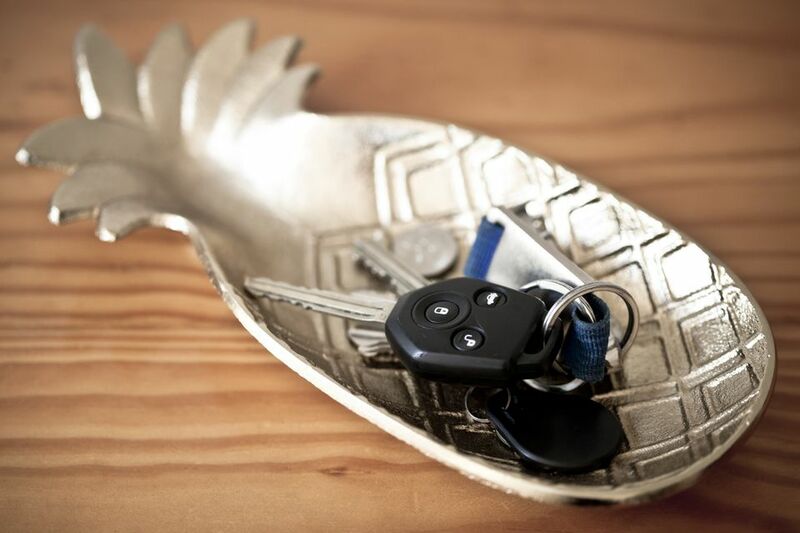 Keep your favorite accessories closeby on your bedside table or vanity in this handmade pineapple dish. 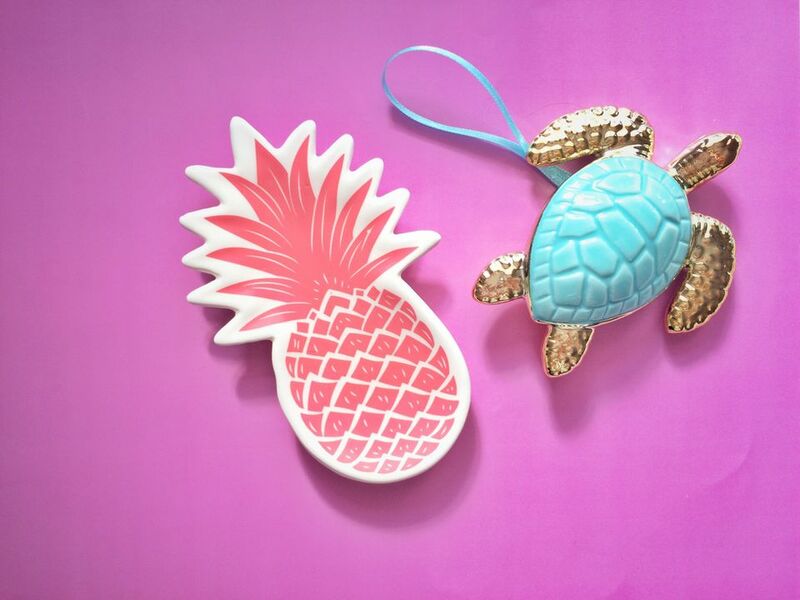 It's made by cutting polymer clay with a pineapple-shaped cookie cutter. Update your flats for summer with clip-on pineapple detailing. When the season is over, just unclip the pineapples and store them until next summer. If you really want to get into the summer spirit, you can easily dress up as a pineapple with this clever costume idea. Otherwise, save it for Halloween this year! Take an ordinary pair of canvas shoes and use paint markers to add some pineapples! If you're like most crafters, then chances are you have a collection of mason jars around your house ready to go for your next DIY project. One clever way to use a mason jar is to convert it into a lovely pineapple luminary jar. Add these to your patio for all your outdoor summer parties. This is a great craft idea for kids. They can journal their summer adventures, keep all their doodles in one place or​ make these for back-to-school season. These notebooks are for adults too! Make a pineapple notebook to keep your grocery lists, meeting dates or your own doodles. Make a tropical table runner that you can use all season long. This pineapple cloth is perfect for summer BBQs. Stock your child's play kitchen or grocery store with several of these paper pineapples. You can print and assemble them yourself, making them an affordable toy. These also make fun party decor! Decorate your house for the season by filling a decorative bowl with several of these pineapple eggs. Empty the shells and decorate them with paint and paper to make a set of cute mini pineapples to last you all summer long. Update your weekender bag with a DIY leather pineapple pouch. Attach it to the handle of your bag, and it makes for a great way to spot your luggage at airport baggage claim while you're traveling this summer. Cut off the top of a pineapple and scoop out the interior so that you are left with just the outer layer. Use it as a vase for the perfect way to display fresh-cut flowers on your table this summer. Print out your favorite photos from your summer adventures and hang them on your refrigerator using your own set of handmade mini pineapple magnets. This is a chic project to try tonight! Transform a wood bangle with polymer clay and paint into a pineapple trinket box. Use it to store small jewelry or office supplies, such as paper clips. Protect your patio table from water rings! This set of colorful tropical fruit porcelain coasters is perfect for your summer cocktails. You can also make these as a unique and fun hostess gift! Are you hosting a birthday party this summer? If so, why not make it a tropical-themed event. Make these printable pineapple party bags to fill with treats and hand them out as party favors to all your guests. It's hard to believe, but this pineapple is actually a pumpkin in disguise! This is a fun, quirky way to decorate your table for a summer party, or even for Halloween this fall.